Mérida is one of those cities where private life is well-hidden from passers-by. Streets in the city’s historic neighborhoods are lined with doors and windows, but they give little hint of what lies within. This wasn’t always the case. When these homes were originally constructed, they were designed to face the street and advertise the owner’s wealth and good taste through the windows. Over time, as the street became busier and noisier and the neighborhood became poorer, life migrated from the front of the house to the back. At the same time, many large homes were subdivided into ever smaller homes with additional (still smaller) rooms created within or they were simply abandoned completely as the city’s wealthier residents moved out into more fashionable neighborhoods at the edge of town in a pattern that continues today. Or at least a pattern that continues for many of Mérida’s long-time residents. The historic core of the city is well known to artists and an international expat community who have made this a fashionable place to live once again. As historic central city neighborhoods like Barrio Santiago and Santa Anna have become popular again, many historic homes have undergone an often dramatic mix of restoration, renovation, and remodeling as they are reimagined for modern city living. When I travel I often wonder what it would be like to live in the place I am visiting. Not only what is it like for the people who actually live there, but what would it be like for me if I were to pick up and move my own life there. Of course, even at home I am always curious about the homes of my neighbors – always wondering how their houses are built and how they are decorated on inside. Apparently I’m not alone in this interest, as house tours of some sort are available in many parts of the world. Often they are special events designed for local residents and only happen once or twice a year (as in my own city), but in Mérida I was in luck – house tours are a regular activity here, with several organizations offering weekly tours. We chose the house and garden tour offered by the Mérida English Library, where we joined a large group of American expats for the day’s tour. Besides providing remodeling and decorating inspiration, the house tour is an activity that helps connect this relatively small community. (Being part of, but not part of, this community for the morning gave me a glimpse of what my life might be like if I were to pack up and move here: These would be my friends; I would be one of the people hugging everyone and asking about the latest gossip.) In addition to the expats, the tour proved popular with Americans still considering moving here or shopping for houses. There were only a few other curious tourists like us in the group. The tour began with an informative architectural history lesson by our guide for the day, Brent Marsh, a property manager (and chef) with Remixto in Mérida. 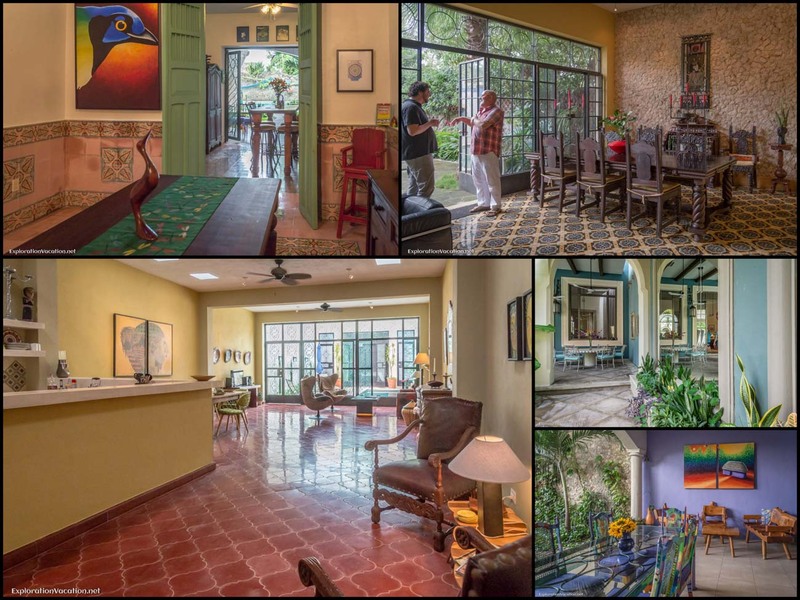 In 30 minutes he managed to clearly explain the history of residential architecture in this part of the Yucatán, as well as how various styles developed and common materials came into use. (“Garbage” sent over as ship ballast – like old railroad iron and no longer usable or fashionable building supplies – were repurposed into construction staples when they showed up on the beaches of Mexico.) Just sitting in the shady courtyard listing to him was fascinating. And then we were off to see the houses. We were lucky, in that usually there are only three houses on the day’s itinerary. Not only did we have a bonus house, but we were promised that it was a really special house. The tours themselves are great because you not only get to see the inside of some amazing houses, but you also get to meet the owners and (best of all) wander around inside on your own. You can spend your time looking at and asking about whatever aspect of the house interests you the most. All of the owners we met were passionate about their homes and the work that they had put into creating them. (The day we took the tour, all of the homes we saw were still owned by the original remodeler. That isn’t always the case.) I learned enough about the challenges of remodeling, restoring, maintaining, and decorating a historic structure in Mexico to know that I didn’t want to do it myself, so I just wandered around enjoying these homes as the works of art they are. We were also lucky to be part of a lively and engaged tour group, one that was eager to share their own experiences – including opening up their own homes for the rest of us to see. By the end of the tour I was inside SEVEN Mérida homes! The houses we saw ranged from a tiny space that was the temporary home of one of the American expats on our tour to an enormous high-concept mansion that many in our group recognized from various television shows. All but one of the houses were owner-occupied, although two were on the market when we visited. We also saw one house where work was still underway, which was particularly interesting. For the most part, none of these houses were true restorations. While the exterior structure and some features may have been restored to their original appearance, the houses had been modified at least to some extent to meet today’s expectations. They weren’t restored as much as they were re-created using historic themes (e.g., stacked rooms and high ceilings for ventilation and cooling) and traditional materials (cement tile, plaster, etc.) in innovative ways. While the original owners of these homes might be baffled by the layout and use of space and materials in their former homes, there still is much they would recognize. The facades of the homes we visited were all pretty basic – none provided much of a hint of what was inside. It is almost impossible to guess what awaits behind any given doorway in the heart of Mérida. Part of the surprise each house holds is created by changes in how houses are used today, now that life has moved from the street to the back yard. Modern renovations turn the house away from the street, often going so far as to move living space – living room, dining area, and kitchen – to the back of the home where they overlook an open courtyard, and then turning the front room into a guest bedroom! Those courtyards, which originally served utilitarian purposes like storage and housing for the family’s chickens and other livestock, are now gracious gardens with fountains and (in most cases) formal swimming pools. The kitchen is one room that hasn’t moved too far over time – originally it would have been a purely utilitarian space at the back of the house for use by the family’s servants. However, while modern kitchens have generally retained a place at or near the back of the house, that is largely so they can be integrated into the surrounding living space. All of the kitchens we saw were beautiful, and most were clearly designed with entertaining in mind. Like the kitchen, the bathrooms in most of the homes we saw transcended their very utilitarian function to become a work of art. And, like the kitchen, most were an integral part of other living spaces – in this case grand master bedroom suites that seemed designed as far more than a place to simply get a good night’s sleep. I loved the mix of modern and traditional in all of these houses; the never knowing for sure what was original to the house and what had been newly created. It would be fun to live in any of these houses, but the conversations with the owners tempered my desire to actually own one. Even for the wealthy and creative, a house like this is a challenge. To start from scratch (as most of these owners did) is beyond my skill set and to buy a completed house (like the ones for sale on our tour) is beyond my financial means. Still, it’s fun to dream. And there are some properties in the neighborhood that look like ideal candidates for remodeling, should I have second thoughts . . . . Located in the central Yucatán just three hours from Cancun, Mérida, is the cultural capital of this part of Mexico. It also has one of the largest collections of colonial homes in Latin America. A tour of Mérida homes is a great way to get to see a side of the city that few visitors experience and to get inside a few of those historic structures. Mérida has a large and vibrant expat community that includes many artists, architects, interior designers, and art and antiques dealers. These are creative people with a real flare for design, and this is clearly seen inside their own homes, which creatively blend the best of historic architecture and modern design. 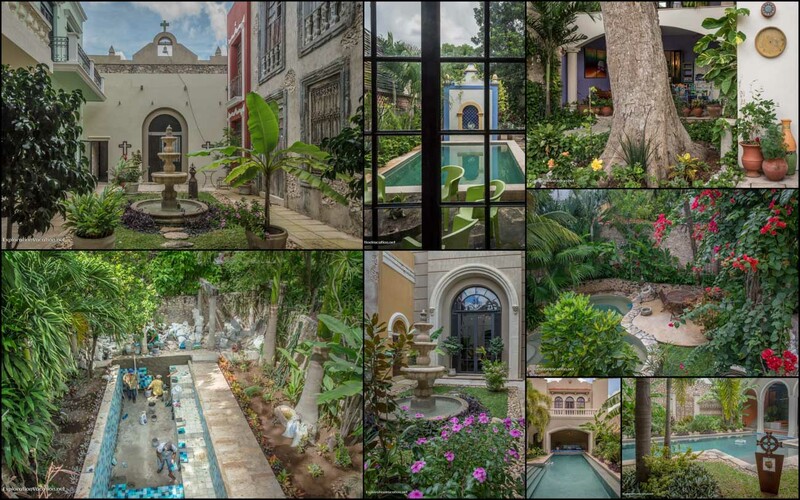 We got to look inside some of these gorgeous homes in the historic center of Mérida as part of the House and Garden Tour offered by the Mèrda English Library. Tours begin with a brief overview of historic architecture and construction techniques in the city before walking to several nearby homes. The walking tour itself lasts about two hours and includes at least three properties. All are located in the historic center of Mérida, Mexico. The English Library’s tours are held on Tuesdays from November through April. In 2017 tours cost 200 pesos (under $15), with a discount for library members. Be sure to confirm the dates for the tours on the library’s web page, as tours are not held on some dates in December and several guidebooks have the dates completely wrong. 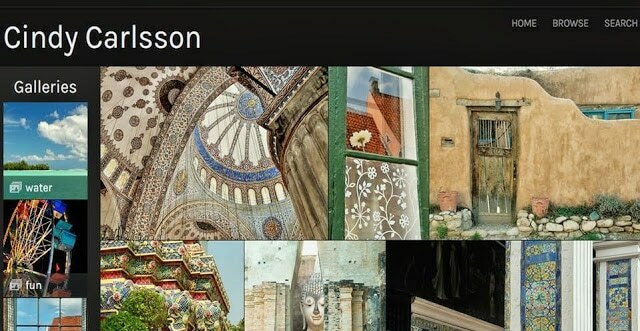 This post is linked to Travel Photo Monday at Travel Photo Discovery where you can take a virtual tour of Meteora, Greece, and other spots around the world. It was really fun to see them the houses in person. I think they’ve filmed a few episodes of House Hunters in Merida – now I’m going to have to try to find them to watch! I’ve heard amazing things about living in Merida. Its still so important to spend some serious time in a place, another country before moving there. You’d be amazed how many people will buy property in a place where they’ve spent almost no time. One of the expats I met in another part of the Yucatan had a whole side business helping people who moved to her area without having any idea of what they were getting into! Merida has a lot going for it, but most of the homeowners were lamenting how much its changed and how you really needed to move there 10 years ago! I love Merida. Bought a house last year after spending eight years going back and forth from the States. The changes I see in Merida are for the better. It is still a safe, friendly, beautiful and culturally-rich city. the only draw-back is that it can get hellishly hot in May, June and July.